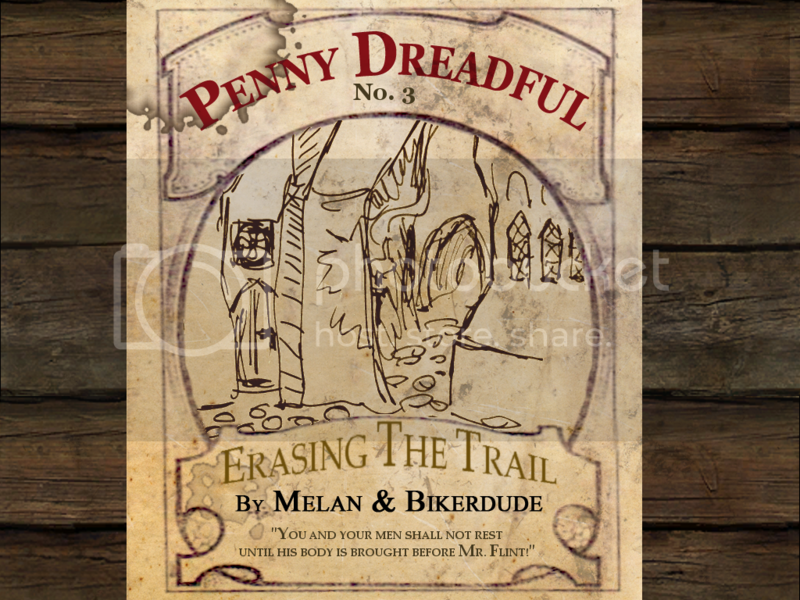 By way of introduction, Penny Dreadful is a fan mission series dealing with the exploits and misfortunes of Gerald Foxley, lowlife and common opportunist. To stick with the theme of lurid and disreputable pulp literature, these missions were planned to be nasty, brutish and short, which sort of worked in PD1, was not entirely working in PD2, and went out the window with PD3, which ended up much bigger than I ever expected. The series also allows me to experiment with gameplay ideas which do not completely fit TDM standards: Foxley is slightly worse at stealth than the TDM baseline, and can't pick locks: you will need to find different ways of getting into places. "Kill a man and take his life; wound him, and restore his pride." -- alleyway proverb. "In a city where every window is an eye and every doorway a whispering mouth, it is hard to keep a secret. When I learned of crime lord Archibald Flint's involvement in robbing me of the Grail of Regrets, I knew I'd have to strike quick, and strike first. But I failed. 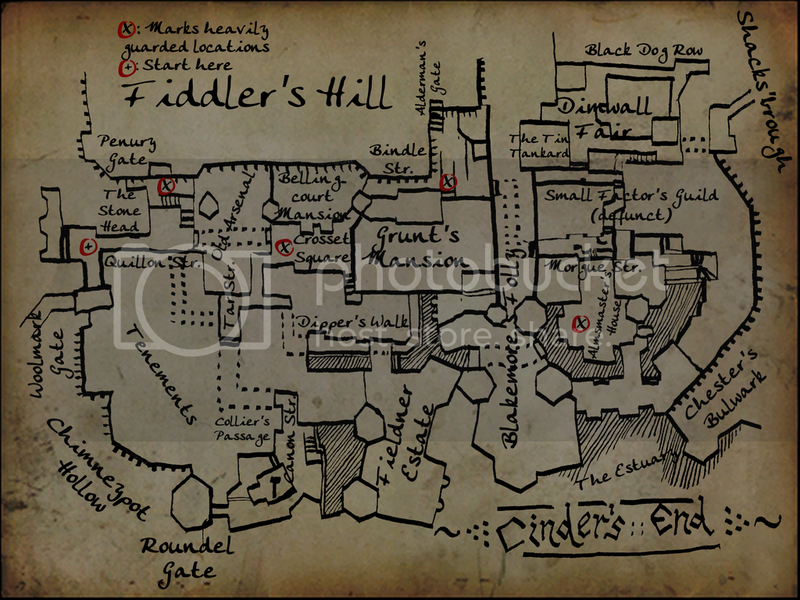 By the time I got near his place on Fiddler's Hill, every gate to his hilltop mansion was locked, every alley patrolled by thieves eager to kill. Two days later, I watched my tenement go up in smoke and flames. The hunt was on, and it wouldn't be over until they'd have their quarry dead or captured. Flint is also looking for my dead body, and I'm planning to have it delivered right to his doorstep. Another underworld figure, Almsmaster Quandt, lives a few streets from Grunt's mansion, and he is said to be my spitting image, an uncanny resemblance. Wonder if Flint will recognise the difference... well, time to find out. Sometimes the only way to deal with a hornet's nest is to kick it over. This night, I am back in the middle of it. I have already run into a pair of sentinels, but I slipped into a small garden and jammed the lock behind me with a bit of wire. Hope they don't raise the whole neighbourhood, or this will be over real quick. Time to get moving." ...and eventually the mission downloader! ***Performance warning***: as usual, this mission pushes the limits a bit (although less than PD2). The hardware requirements exceed the TDM baseline, and the loading time is fairly long. Optimalisation should be credited to Bikerdude, while the remaining problems are all mine. Erasing the Trail is intended to be an open-ended city exploration mission, where you can approach your objectives from multiple angles, and discover multiple solutions to complete them; some more straightforward, some more obscure. Gerald Foxley is a rank amateur who can't pick locks. You will have to find alternate means to break into places. You can find my concept art in the PK4 file. These images obviously contain heavy spoilers. This mission series predates, and is thus unrelated to the Penny Dreadful TV series. The Canon Texture project for texture work. Last edited by Melan; 16th Jul 2016 at 04:26. Great! Thank you both & congrats on the release. Awesome, can't wait to play it. Congrats Melan and bikerdude! I had a blast doing the voice acting and look forward to playing this one. You knocked this one out of the park. Just excellent. What can i say. Pure thief action from the masters. I would suggest not to wait. I've been playing for hours, this mission is immense. It far surpasses any Ive played for Darkmod . LOL, I'm literally looking at the list of changes right now. Some excellent new features. I've achieved the main objectives (on Medium) but have still not accessed all areas. This is indeed a great mission. I started the game under Dark Mod v2.03. If I upgrade now to v2.04, will I be able to resume my old save games? No, you can't use your old save games. Can you tell me, how you fulfilled the 2 main objectives? I don't recall if I had a map at the outset or found it somewhere, but the locations of your two victims are fairly well marked on that map. Is it transporting them/disposing of them that is your problem? No, "not-able-to-read-a-map" was my problem. Thanks for the hint. Ok I solved the Almsmaster objectiv, but what shall I do with Grunt. Shall I kill him or find/ put some evidence somewhere? 3. In Almsmasters house can I get into the room which looks like an office an has a barred window? Great addition to the series Thanks to all involved was a pleasure to play!! I finished two of the main objectives and upgraded from 2.03 to 2.04 and seems like its working fine. My saves reset after the upgrade, so I'd hesitate on that one. That said, it's a fun mission, I didn't mind getting to play some of it again. Me too (if by reset, you mean a game saved under TDM v2.03 loads as a new game start under v2.04). But I also don't mind replaying it, e.g. I have now found a book of dark poetry but I have not yet found the tribute to Lady Rowena! I started this mission, walked a bit and stopped to enjoy the scenery Then i said: OK, time to start playing. 2 minutes later I stopped again. Everything in this mission was perfect, visuals, gameplay, audio. And i loved that it had lots of everything you'd want. Love it, ironically I'm watching the penny dreadful series (w./Eva green) now on netflix. Loving this mission, really big, i got inside Almaster house, i killed two guys that were inside, is any of those guys? 2. Visit a certain person under house arrest and examine a similar statue belonging to him. 3. I'm pretty sure this is intended. Apparently, the only stuff of worth can be accessed through the window. He should be identified as the Almsmaster when you pick up his body. Thanks for your help, but for question two I need a bigger hint. I didn't read all the scrolls and books and so I don't know how is under arrest or which statue you mean. 1. There is a house which looks like a hotel with three doors. I don't have a key for the one near a ladder to an not openable attic. 2. Somewhere is a valve next to a down arrow. What does this thing do?